A log of cooking activity. Mignardise are small little sweets that you get at the end of a fancy meal. They are often an assortment that contains not only chocolates, but also other candies or cookies. This year I just made three quick chocolate based mignardise, and we passed them around with coffee. 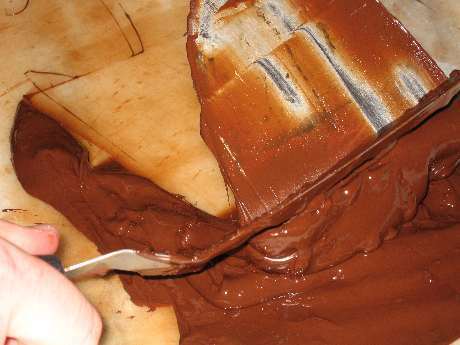 There's really only one trick to chocolates, and that's tempering the chocolate itself. It's certainly an odd process, and the first 3 or 4 times you do it, you really think it's not going to work. I like to use the "tabling" method pictured above, because the chocolate comes into temper very quickly, and remains smooth. If you don't have a flat surface (I have a marble board) you really can't table chocolate. It's also pretty messy no matter how careful you are. It's not very clear in the above picture, but I use a combination of an offset spatula and a drywall knife when I table the chocolate. The most important thing, however, is to check that the chocolate actually is in temper by dipping something like the back of a spoon into it. If the chocolate is in temper, the spoon will set up very quickly (less than 5 minutes). If after 5 minutes, the chocolate is soft, you haven't lowered the temperature of your chocolate enough. For dark chocolate, anything above 88 degrees isn't yet in temper (85 for milk and 83 for white). The first chocolate (not pictured) was white chocolate "bark" with finely diced nuts and dried fruit. It's pretty easy to make normally, you just thinly spread the tempered chocolate onto a Silpat, and then sprinkle the topping. You can score the chocolate once it starts to set, or you can simply break it into irregular shapes when completely cool. I say "normally" because I was lazy and did not check the temper on my first batch. Of course, it was too hot and did not set properly. $8 of white chocolate into the trash because it already had fruit bits in it. 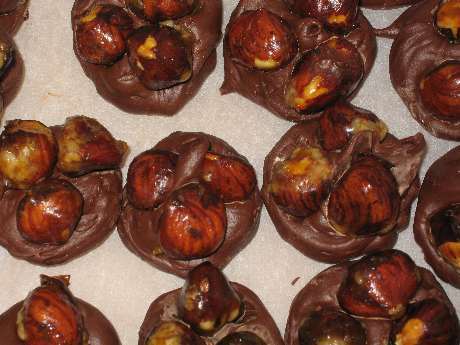 A Hazelnut Candy known as "Three Brothers"
This candy is easy to make if you can find ready made bars of gianduja (which I was able to). If you cannot, you have to grind the hazelnuts and chocolate together in a food processor. This isn't difficult, but it is quite hard on the food processors. At school we broke several because of the strain you put on the motor. Once you have tabled the gianduja, you pipe it into rounds and top each with three hazelnuts that have been "draggeed" with sugar to both toast them and make them shiny. 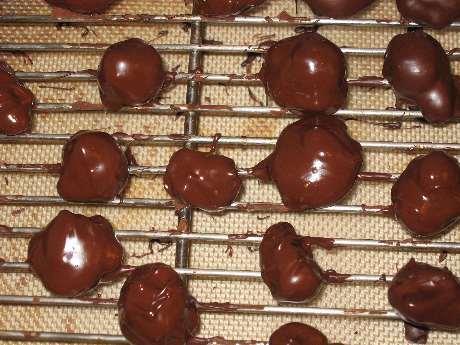 Truffle centers are formed via a basic hard ganache, then dipped twice in tempered chocolate in order to form a nice hard shell. The first "dip" is actually easier to do with latex glove coated hands, and you really just need a "sealer coat". The 2nd actually does need to be properly dipped in order to look reasonably nice. Lots of recipes will have you cool the centers in the fridge, but I was taught instead to table the center chocolate until it starts to set up, and then pipe the resulting mixture to make the truffles. This is messier, but much faster overall -- it takes two hours to cool the centers in the fridge. I'll be the first to admit that I'm not the best chocolate maker when it comes to the final look. I really can't get my truffles into any kind of round shape even after rolling them in my hands. I just tell myself that they are supposed to look like the mushrooms anyway.